CleverTexting : No multitap, no chording or mode change. A new Ergonomic single keypress typing that is easy on your thumb. This version for French on phones through statistical predictions and dynamic key allocation. Offers SMS compression. Makes predictions of what you want to type based on what you have typed just before. Look for the character you want and press the indicated key. If character not on list, press Next List button. Learn over 600 French words and phrases. Windows program for expanding French vocabulary. A fun way to learn basic French words and phrases using learning games. English-French Talking Dictionary for Windows 4.1. English-French learning applications for PC. Qweas is providing links to CleverTexting French 2.0 as a courtesy, and makes no representations regarding CleverTexting French or any other applications or any information related thereto. Any questions, complaints or claims regarding this application CleverTexting French 2.0 must be directed to the appropriate software vendor. 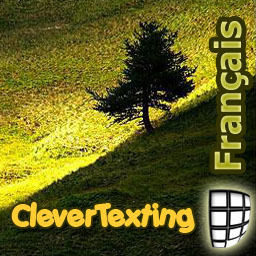 You may click the publisher link of CleverTexting French on the top of this page to get more details about the vendor.